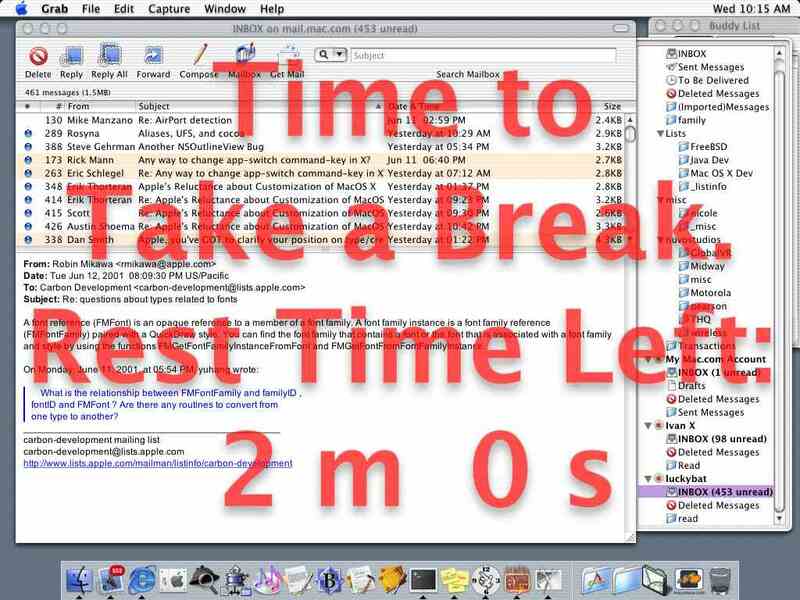 RestTimerX is a utility for Mac OS X that reminds you to take breaks from typing, at intervals you specify. It operates in a similar way to Kensington MouseWork's "Rest Reminder" featurehowever, since the current beta version of MouseWorks for Mac OS X is missing "Rest Reminder", I decided to write my own replacement. Now, rather than being reminded to take a break by an alert that takes the keyboard focus away from whatever you were doing (which is a PAIN), it's now a big, translucently-overlaid banner that can't be hidden. Take a look at the screenshot (100k) to see what I mean. It also lets you know when your rest break is over. The author of this program can be contacted at <luckybat@mac.com>.